Everyone loves a personalized gift. It shows thought and care was put into the wedding/Christmas/Hanukkah/birthday present, which usually means more than the gift itself. Marketing and consumer development people have grabbed a hold of this thoughtfulness for the upcoming holiday season and caught the attention of many by both holding back and adding the extra touch. Mashable recently posted a video of JCPenney’s new holiday promotion: a QR code card that records a voice message to the gift recipient. Not only does this marketing tactic explore new technology options but gives an extra opportunity to consumers to put meaning into their gift. 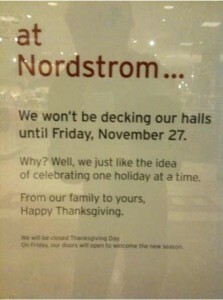 Through a Facebook status post, I learned of Nordstrom holding off on decorating their stores for the holiday season until November 27; because “well, we just like the idea of celebrating one holiday at a time.” As of this afternoon, a picture of the in-store poster that Nordstrom announced this plan with had over 18 thousand “shares” on Facebook. Their Facebook page has endless wall posts of Thank You’s and “I plan on spending my holiday budget with you now” all because they put the breaks on the overkill that holiday shopping has become. Did they intend for their poster to go viral? Not likely. But no doubt, it got more traffic to their Facebook page, website and stores. I’d love to see their analytics for November. Provoke an emotion in your marketing, and you might just be the talk of the town.